This announcement is one I’ve been saving for months until it was confirmed. Now that it is… I’m one plane ticket booking away from attending the Trichotillomania Learning Center’s 2013 conference from April 19th- 21st! I took part in the 2011 conference, which celebrated their 20 year anniversary and let me tell you… it was amazing! It is an experience that every person who suffers from Trichotillomania or Dermatillomania needs to go to at least once in their lifetime. What you receive from TLC just from a Basic Membership! These disorders are fueled by silence and most of us are lucky to knowingly meet one other person in “real life” with the same struggles as ourselves. This conference brings us all together to connect, helps us learn other coping strategies, lets us meet the top professionals who are dedicated to finding out more about the medical side of our disorders, and teaches us how to move forward with our lives. Not only am I going to be attending, but I will be facilitating 2 workshops: “Intimacy”, for adult women with both Body Focused Repetitive Disorders (BFRBs) and “Tickets to Happiness” for children 12 years of age and younger with BRFBs. One more incentive to attend… the documentary *MAY* be shown in full as the first public viewing ever! The workshops have been confirmed and I have planning to do, but the documentary viewing is still up in the air. The film is so close to being completed that I can almost taste it; this past Friday I completed the voice over for it and all it needs is to be added to the documentary and nearly three and a half years of hard work from everyone involved will have paid off! When people hear of the Trichotillomania Learning Center, they automatically think of an organization that helps the hair pulling population but I need to stress that it’s also a group that equally helps the skin picking community. Reasons why they used Trichotillomania in the name of their organization could be that Dermatillomania wasn’t (and still isn’t, until this May when it’s under a different name) in any DSM or that it started as a group exclusively for hair pullers. It’s only my speculation but in present day, they serve both communities since the characteristics between the two disorders are strikingly similar. 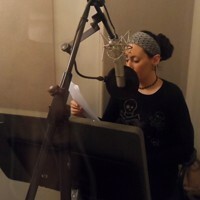 Recording the Voice Over for the “Scars of Shame” documentary. I was also asked to be a part of a panel discussion at the conference, which is extremely exciting! The details haven’t been confirmed, so I don’t know what I’ll be speaking on yet exactly but I’m ready to do anything that can help other sufferers of Dermatillomania. If you are interested in purchasing my book in person, there will be copies at the conference and I’ll sign them if you track me down; I’d love to meet every person who has followed my journey and given me so much support and motivation! I don’t know if we will be selling copies of the documentary yet or if Lisa Heyden (director) will be coming with me, so there are still some details to iron out- I just couldn’t wait to announce my attendance any longer! Become a TLC member today and earn a significant discount off of registration fees (more than what the basic membership costs!) while enjoying the yearly perks of seasonal newsletters, free webinars, and much much more! Sign up for the early bird special before March 19th, as a member, to receive this discount. Let’s expand the Dermatillomania community and come together for this life-changing event… and I need to tell you, it’s worth every penny and more to have this eye opening experience. I hope to see you all there!